Becoming a Business – Is Now a Good Time? Every day I speak with lots of folks about the business brokerage industry and how to become a business broker. I am often asked, “ is now a good time to become a business broker.” Considering I have been a business broker for 23 years – and loved most of them. I own a school that provides training for business brokers (School of Business Brokerage) and Business Intermediary Services – a company that provides specialized marketing services for business brokers; it would be hard for me to give an unbiased answer. As you might imagine, I think it is always a good time to become a business broker. Seriously, let me share some important facts and reasons why now is a good time to become a business broker. As I write this article, we are in the early days of 2018. The economy is growing; consumer confidence is high and most small business owners have rebuilt their business following “The Great Recession ” and are optimistic about this year and the future. Therefore, potential business buyers will view purchasing a small business is a good idea and a good time to take the risk given the strong economy. “The Great Recession” resulted in a substantial downsizing of the business brokerage industry. Although clear, data is not available, the number of business brokers in the United States is at one of the lowest levels in decades. From late 2008 until 2013 (or later) business brokers found it very challenging to make a living and left the industry. So, it is a matter of supply and demand – there are lots of business owners wishing to sell their business and not enough business brokers available to price the business, market the business and find qualified buyers. Although the volume of lending for business transfers has not completely rebounded, Small Business Administration (SBA) backed lending is expanding. Program guideline changes, approved late 2017, in general, will allow a buyer to obtain financing with a smaller downpayment. When the amount of money needed for a downpayment decrease, it makes it easier to buy and sell businesses. Any time of the year is a good time to become a business broker. However, the beginning of a year is definitely a good time. Why? Business brokers often take a substantial portion of their new business listings from January through May. Business owners are having their business and personal tax returns prepared. Some probably had a record business year in 2017 and are contemplating if now is the year to sell their business. With some training and willingness to work hard, a new business broker should be able to list several businesses over the next few months. 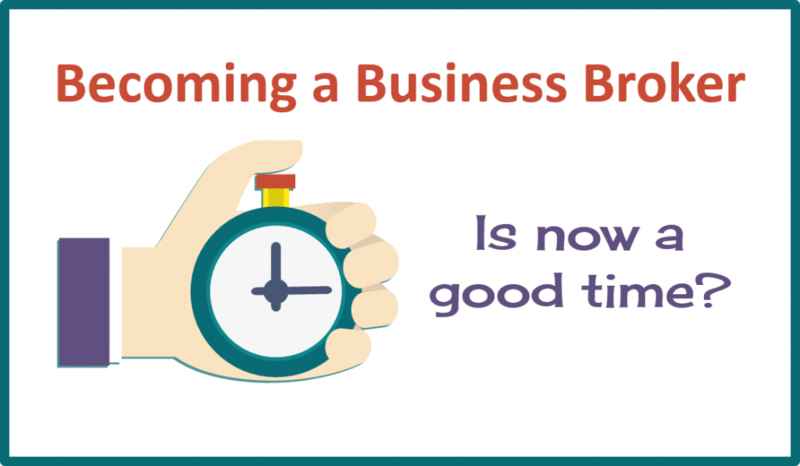 Not one, but several good reasons why now is a good time to become a business broker. If you are thinking about becoming a business broker, give me a call. I am always happy to speak with individuals interested in the business brokerage industry, and the career opportunities it offers.